I have two cards to share with you tonight. I loved working with this kit so much, I just couldn't stop stamping with it! The flowers were stamped with Red Hot, Orange Zest, Pure Plum and Black Licorice ink, the leaves in Fuse Green and Jellybean Green ink. 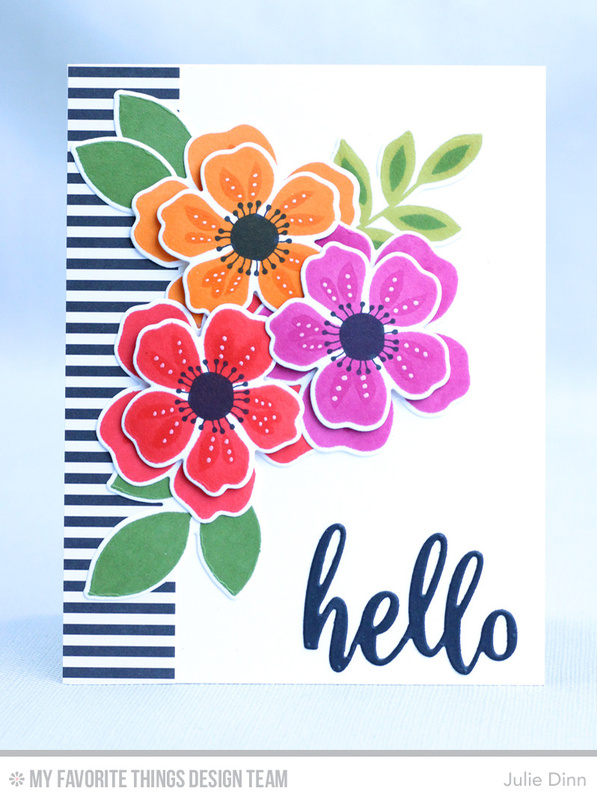 I paired the flower arrangements with a strip of the Dots & Stripes Neutral Paper Pack and a hello die cut in Black Licorice. The black and white stripe paper really is a great touch! Beautiful card! I just love the vibrant colors in your beautiful cards. I always enjoy your unique style. Great card! Two sensational cards! I love how you used similar design elements on both but switched it up a bit and created two distinct but equally impressive looks! Love the black flower centers to pick up the b&w paper! Awesome look! Both are stunning, look so different and unique! Both of your cards are beautiful! I love the bright colors because they look so happy and cheerful! I like the double layer on the flowers. I love this card! I love the striped background paper and how you added white accent dots to the flowers! Love your cards. The white dots and double layers on the 2nd card are awesome. This is so gorgeous. Like the black and white edge. Great card. I love the stripes behind the floral design. Very awesome cards ! My favorite is the second one, I really love the white dots, they highlight the flowers. Thanks for sharing. What a fab pair of cards! I think I like the white dots and layers a smidge better. Absolutely in love with these cards - the color scheme is gorgeous and I love the added touches of white!! Wonderfully done and just so impressive!! Love the white details on the flowers. I really like both of your cards. The colors are amazing together and the white, gel pen details make a nice finishing touch. Beautiful! I love the designs on both the cards. I love the vibrant colors too. Love the full blooms and the colors! Very pretty--I like the bold colors. Love all the bright colors with the pop of black. Yum!! Julie, both of these are precious. I am inspired. I want to "replicate" this idea. I can't do it exactly, I don't have the things you used, BUT it's like a template. I love it!!! TFS. Lovely cards! This new kit is full of wonderful products! Colors in this kit are beautiful. Wish I could have gotten to it in time! Gorgeous! The white dots on the 2nd looks fab. Beautifully crafted card, Julie! Love it. I love the black striped paper on both of the cards. Really classy! Beautiful cards....love the colors and striped paper accents! 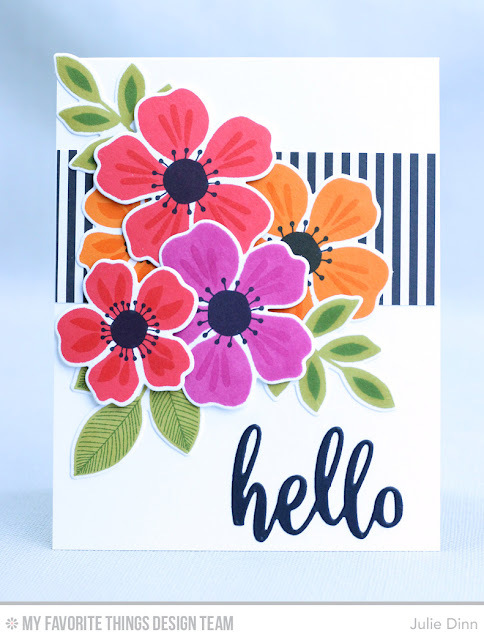 Beautiful cards and the flowers go with the black stripped paper perfectly! Can't wait for my kit to arrive!